12 ARKANSAS Fayetteville Washington Regional Medical Center wregional.com CALIFORNIA Fresno Saint Agnes Medical Center samc.com Upland San Antonio Regional Hospital sarh.org COLORADO Brush East Morgan County Hospital bannerhealth.com/ eastmorganspirit Denver Swedish Medical Center swedishhospital.com Fort Collins Banner Fort Collins Medical Center bannerhealth.com/ fortcollinsspirit Greeley North Colorado Medical Center bannerhe alth.com/ ncmcspirit Loveland McKee Medical Center bannerhealth.com/ mckeespirit Pueblo Parkview Medical Center parkviewmc.org Sterling Sterling Regional Medical Center bannerhealth.com/ sterlingspirit CONNECTICUT Waterbury Saint Mary's Hospital stmh.org FLORIDA Boca Raton Boca Raton Regional Hospital brrh.com Jacksonville Baptist Medical Center Beaches Baptist Medical Center Jacksonville Baptist Medical Center Nassau Baptist Medical Center South Wolfson Children's Hospital BaptistJax.com St. Petersburg BayFront Health St. Petersburg bayfrontstpete.com Tampa Florida Hospital Tampa FHTampa.org Wesley Chapel Florida Hospital Wesley Chapel FHWesleyChapel.org GEORGIA Atlanta WellStar A tlanta Medical Center – Main Campus wellstar.org Austell WellStar Cobb Hospital wellstar.org Douglasville WellStar Douglas Hospital wellstar.org East Point WellStar Atlanta Medical Center – South Campus wellstar.org Griffin WellStar Spalding Regional Medical Center wellstar.org Hiram WellStar Paulding Hospital wellstar.org Jackson WellStar Sylvan Grove Hospital wellstar.org LaGrange WellStar West Georgia Medical Center wellstar.org Marietta WellStar Health S ystem WellStar Kennestone Hospital WellStar Windy Hill Hospital wellstar.org R oswell Wellstar North Fulton Hospital wellstar.org ILLINOIS Peoria OSF Saint Francis Medical Center osfsaintfrancis.org INDIANA Crawfordsville Franciscan St. Elizabeth Health – Crawfordsville franciscanalliance.org Greensburg Decatur County Memorial Hospital dcmh.net/spiritofwomen Lafayette Franciscan Health FranciscanHealth.org Newburgh The Women's Hospital deaconess.com Seymour Schneck Medical Center schneckmed.org MARYLAND Hagerstown Meritus Medical Center meritushealth. com MICHIGAN Alleg an Allegan General Hospital aghspirit.org Fremont Spectrum Health Gerber Memorial spectrumhealth.org/gerber Iron R iver Aspirus Iron River Hospital aspirus.spirithealth.com Ironwood A spirus Grand View Hospital aspirus.spirithealth.com Laurium Aspirus Keweenaw Hospital aspirus.spirithealth.com Ontonagon Aspirus Ontonagon Hospital aspirus.spirithealth.com MINNESOTA Winona Winona Health winonahealth.org MIS SISSIPPI Hattiesburg Forrest General Hospital forresthealth.spirithealth.com MISSOURI Chesterfield St. Luke's Hospital stlukes-stl.com MONTANA Great Falls Benefis Health System benefis.org NEBRASKA Fremont Fremont Health fremonthealth.spirithealth.com NEW JERSEY Elmer Inspira Medical Center Elmer inspirahealthnetwork.org Jersey City Jersey City Medical Center barnabashealth.org/Jersey- City-Medical-Center/Our- Services/W omens- Health.aspx Newark Saint Michael's Medical Center smmcnj.org Vineland Inspira Medical Center Vineland inspirahealthnetwork.org Woodbury Inspira Medical Center Woodbury inspirahealthnetwork.org NEW MEXICO Albuquerque Lovelace Women's Hospital lovelace.com NEW YORK Buf falo Gates Vascular Institute Kaleida Health Buffalo General Medical Center Women's & Children's of Buffalo kaleidahealth.org Hamilton Community Memori al Hospital communitymemorial.org North Tonawanda Kaleida Health DeGraff Memorial Hospital kaleidahealth.org/deg raf f © 2016 Relevate Health Group. All rights reserved. 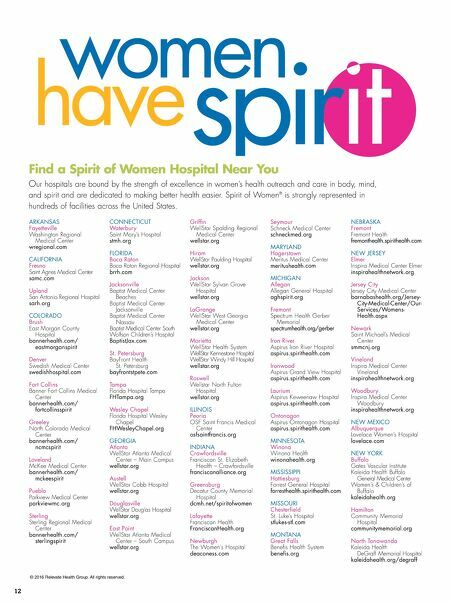 Find a Spirit of Women Hospital Near You Our hospitals are bound by the strength of excellence in women's health outreach and care in body, mind, and spirit and are dedicated to making better health easier. 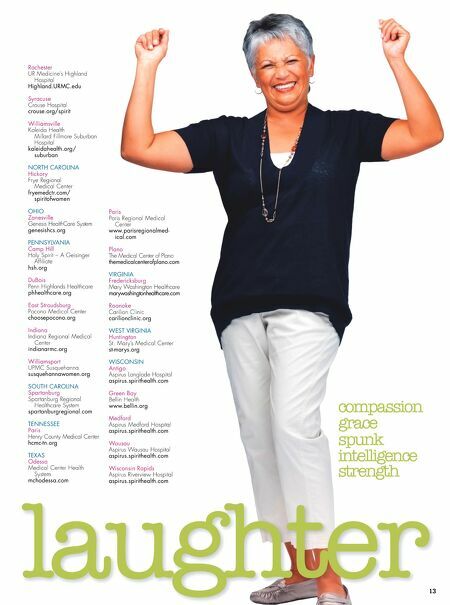 Spirit of Women ® is strongly represented in hundreds of facilities across the United States.